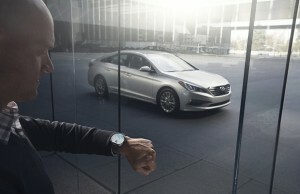 Technology » Hyundai Cars to be App Controlled ! If you thought apps and androids were the business of the electronics giants, you are surely wrong. Just have a look at what Hyundai has made for their cars. The South Korean car manufacturer is going to integrate a new feature called to its cars. The feature will allow tech freak car drivers of the new generation to control certain features of their cars from their wrist. That’s where technology has brought us. There was a time when the car keys referred to a noisy bunch each for opening the, doors, the boot, the petrol lid and finally one for starting the engine. This continued till the Japanese car makers told that we could do all this with just one key. This went further to the push button start where the key became a wireless dongle that you simply puts in your pocket. And yesterday Hyundai said, from now on you just have to download an app from the Play store to start your car. Now to those who think that looks interesting, there is even more about it. The Blue Link Android wear app from Hyundai will allow users to start or stop their car’s engine from the Android wear device that you may tie to your wrist. The Android wear also lets you Lock or Unlock your car and also has options to honk the horn or blink the head lamps if necessary. It also integrates some security features like anti-theft alarm and GPS tracking in case you forget where you parked your vehicle. Another advantage of the blue link is that it has no range limit as it functions on mobile data and not direct radio signals. Now that means that you can now start your car in your garage at home while queueing up at the busy metro station, just in case you miss it!